Port Douglas Condominium is situated in a near perfect position. 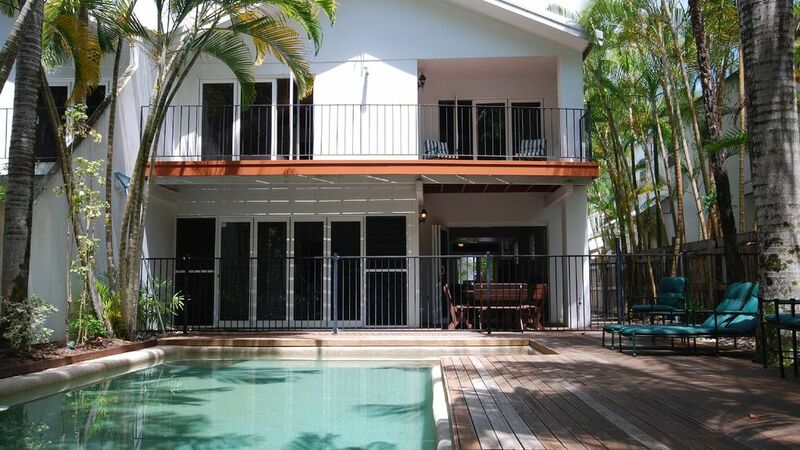 It is an easy walk to the heart of Port Douglas and has direct beach access. There is nothing between you and the beach except the tropical rainforest. The house is at the end of a quiet cul-de-sac and has secured off street parking for two cars or a fleet of bicycles. With approximately three hundred metres of floor space, tall cathedral ceilings and large outdoor living spaces, everyone will have plenty of room to spread out. The heated saltwater pool is facing the foreshore and has a timber deck with plenty of seating for everyone. Three of the four bedrooms overlook the pool with those upstairs having their own private balconies. You will wake to the sounds of waves breaking on the beach and birds calling in the rainforest! There are four large bedrooms all with their own en-suites with marble tiling. White plantation blinds, folding doors, louvres with screens and full air conditioning will assure your comfort. The master bedroom on the ground floor overlooking the pool. Two more bedrooms are upstairs as well as a mezzanine level which serves as a great retreat. The fourth bedroom is on the other side of the house offering a space for that person looking to be away from the rest. In the centre of the villa is a modern kitchen with Corian bench tops and servery. Everything you could want including a walk-in pantry is provided. All you need to bring is food and wine. A sunny courtyard leads off the kitchen with outside dining and an electric awning / sun shade. There is an additional internal dining table in the fully air-conditioned living area. The entertainment system includes a TV, DVD, CD Foxtel and WiFi internet connection. You will be pleased to have found such special accommodation so close to nature and the centre of Port Douglas.